SoloCinema XTR ® delivers High-Definition home theater surround audio in a two-component package – powered soundbar and wireless subwoofer. Reviewed as “an industry benchmark” and a “design triumph”, this product is a high point in our work with Definitive Technology. 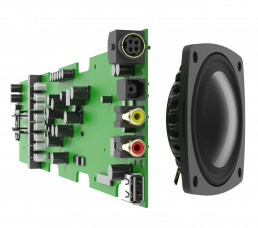 We were responsible the industrial design and early stage mechanical development for the soundbar, subwoofer and remote. We also created all marketing collateral, including point-of-purchase box, promotional graphics, and Quick Start Guide. Definitive Technology developed and patented an ultra-thin driver for it’s XTR line of speakers. This innovation lead the way for the the form factor of the Solocinema XTR. An ultra-thin high performance soundbar with built-in amplifier. SoloCinema XTR® was an ambitious undertaking. The goal was to create an amplified soundbar that corresponded to modern, ultra thin displays. We looked for all opportunities to reach this goal including poking the driver magnets through the extruded aluminum back housing. We defined the mechanical details for the soundbar, sub, and remote before handing off to the internal team at Definitive to push over the line. Following the development of the XTR hardware, we were tasked with designing all the associated marketing collateral. The box had to work as a silent salesman in big box stores. To do so, we worked with the in-house marketing team at Definitive to develop visuals that matched their sales message. We created all the technical illustrations for the quick start guide and, also used many of these assets in a point-of-purchase showroom brochure. 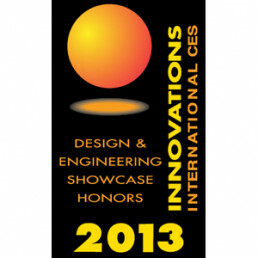 Solocinema XTR was an ambitious engineering challenge and the CES judges recognized it’s innovations. We helped Definitive Technology cram a lot of amazing technology into a slim and elegant package. A true innovation.